December 15, 2011  Presidential candidates have been sounding off about millionaires on food stamps, but the reality is harsher. Even in high-income zip codes, the formerly well off are having to turn to food stamps to put food on the table. That's according to two new surveys of food insecurity and income. 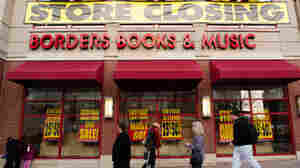 October 2, 2011  It's been about two weeks since most of the remaining 400 Borders bookstores closed. Communities have lost a gathering place and a resource, and almost 11,000 people lost their jobs. In the final days, some former employees opened up about the frustrations of the job. 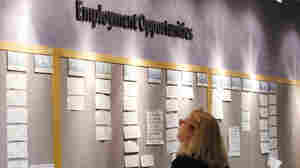 September 2, 2011  The nation's unemployment rate remains just above 9 percent, and political observers say it's just about impossible to cast that kind a number in a positive light. That puts extra pressure on President Obama ahead of next week's jobs announcement. 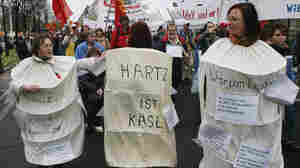 September 2, 2011  Long-term unemployment is worse than it's been at any time since before World War II. That's very bad news not just for the unemployed, but for the long-term health of the U.S. economy. 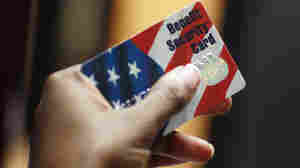 July 14, 2011  retail and food service sales were up in June, according to the Commerce Department. Seasonally adjusted sales were up 0.1 percent. And the number of new unemployment claims fell last week. 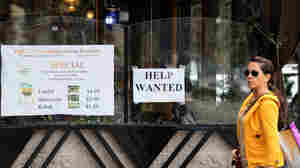 July 8, 2011  Economists are expecting the Bureau of Labor Statistics to say that only about 90,000 jobs were added last month, and that the jobless rate stayed at 9.1 percent. When Will The Economy Get Better? June 21, 2011  Unemployment is still dangerously high but things are looking better for both households and companies, says economist Mark Zandi. June 3, 2011  The news is weaker than had been expected. April 19, 2011  The largest gains were in North Dakota, Vermont, Alaska and Texas. The largest losses were in Kansas, New Jersey and New Mexico. April 1, 2011  Private payrolls grew by 230,000. January 7, 2011  December's jobless report showed how difficult a re-election climate Obama will face. Ben Bernanke reminded senators Friday that the nation lost nearly 8-1/2 million jobs in 2008-2009. But its only gained 1.3 million jobs in 2010. January 7, 2011  While the unemployment rate fell nearly half a percentage point, to its lowest level since May 2009, the number of jobs added to payrolls wasn't large. But revisions to previous months showed job growth was better than first thought.